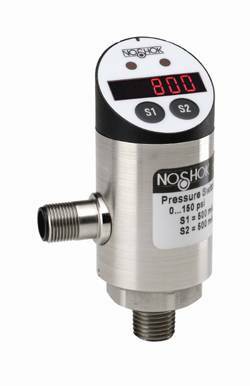 The NOSHOK 800 Series Indicating pressure Switch / Pressure Transmitter provides continuous pressure monitoring and allows programming of the set points without pressurising. Available as a pressure switch / transducer with one switch output and one analogue output (4-20mA or 1-10VDC) or as a two switch output electronic pressure switch. Set points, contact functions (n.o. or n.c.), reset points, contact function (hysteresis) are easily adjusted via the two buttons on the indicator head. The indicator has 7 segment, 4 digit LED display and a 330 degree rotatable indicator head. Ranges are available from -100kPa to 62MPa through simple two key programming and integrated password protection. The unit is also available in a temperature switch / transmitter version. NOSHOK offers exclusive 3 year warranty on the Series 800 Indicating pressure Switch / Pressure Transmitter.